There's something to be said about the respect that experience brings. When you bring 50 years of experience in building fiberglass boats in the highest quality and standards, then you can expect respect from the entire industry. This is what Sea Ray puts into every boat they make for sale, from 17 feet, to 60. Ever since the beginning in 1959, Sea Ray boats have been innovators in design and manufacturing. C. N. Ray founded the company in Oxford, Michigan and was one of the first boat builders to use fiberglass, and it is from these humble beginnings that Sea Ray boats has built a foundation as one of the top builders in the world. Even in the early days Sea Ray was pushing the design envelope with automobile style gauges and interiors in 1966 to the eye catching and head turning SRX Pachanga in 1969. In 1986 Sea Ray joined forces with Brunswick to be the world's largest producer of boats and marine engines. With Sea Ray's dedication to quality, and Brunswick's size and strength, the relationship flourished. 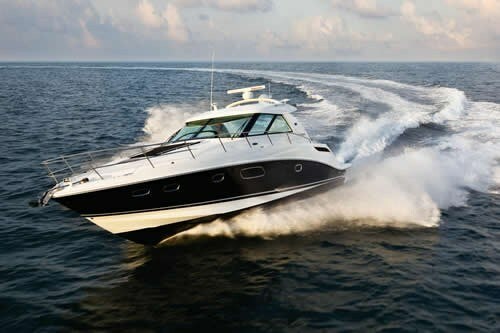 Brunswick was able to provide Sea Ray with the resources needed to employ some of the industry's top people, and build on their already stellar reputation. Today, that reputation is stronger than ever. With over 40 models including sport boats, bow riders, Sedan Bridge, Sun Sport, Sundeck, Super Sport and the most popular Sundancer, Sea Ray continues to rank in the top (if not the very top) in customer service satisfaction of all powerboats in the industry. These boats are also built to last. There are many used Sea Ray boats for sale that still represent the highest quality. Having a great product is a big help, but also having a dealer network that stretches across North America, including a Master Deal Program that is committed to making every Sea Ray experience a positive one. And that it is. Find any Sea Ray owner, either of a new vessel off the line or a used Sea Ray, and you will find they are dedicated to their brand often stay within it. They speak passionately about their vessels and trade stories with other Sea Ray owners of all sizes. From humble beginnings in Michigan to a worldwide leader, Sea Ray has come a long way. But it speaks volumes for how far dedication to quality, design and customer service can take you. Sea Ray owners and dealers alike will tell you, when you're buying your first Sea Ray, you're getting more than a boat... you're getting a way of life.